After deciding to go with 50 mm wide tires for my touring bicycle with 28" wheels, finding mudguards suddenly became pretty easy. There was simply no other choice than the SKS Bluemels. They come in many different widths: 35, 42, 45 and 65 mm. I would have preferred 50 or 55 mm, but the upside is I can change to even wider tires in the future. In total there are 19 different versions, for 26" and 28" wheels in silver and black. The outside is plastic, and supposedly it has an aluminum core. The stays are made of 3 mm thick stainless steel and are very sturdy. I was not able to cut them with a cable cutter that can also cut spokes. 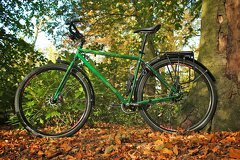 My bicycle has the mounting points for full length mudguards, but it also has disc brakes. The SKS Bluemels are not very suited for this. 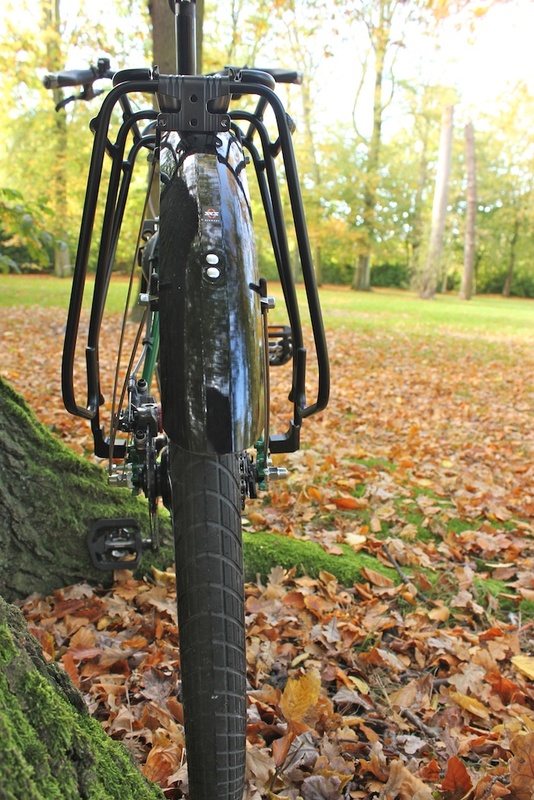 On both front and rear mudguards there are metal attachments through which the stays go. Putting them in there is kind of finicky, as you have to put a plastic cover over it as well. Inside this plastic cover there is some room for adjustment, but only maybe 10 mm. This means that you can only mount the stays in the middle of the wheel, otherwise the stays will not fit. This limits the amount of options very much. Bending the stays is also not an option, they are not very easy to bend, and would end up being much weaker and too short for the amount of bending required. The Hebie Viper Stadmeister mudguards don't have any of these problems. 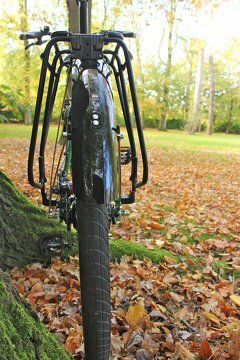 The stays are adjustable in length, and can be mounted anywhere along the mudguard have the same safety release and even manage to look better! The same problem occurred on the left side, on both the front and rear. There is simply no way to fit these things with enough clearance around the disc brake calipers. I had to use much longer bolts to get it to fit. In the rear mudguard I had to drill a hole to attach it to the stay there, no big deal but it should have included a screw for that. 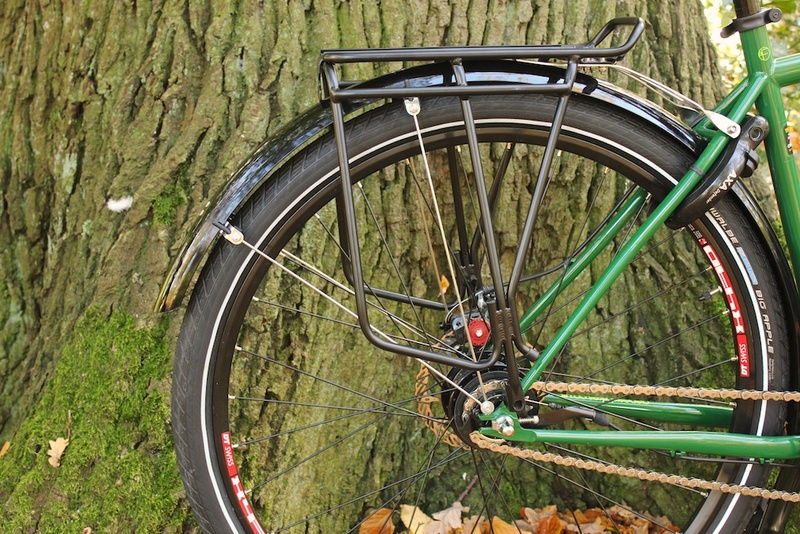 The SKS Bluemels are full length mudguards that are available in many different widths. I have no problem with their ability to catch mud and dirt. But they don't play well with disc brakes. Even if you don't have disc brakes I would not recommend these mudguards as they are finicky to install, don't look very good and have very limited adjustability. 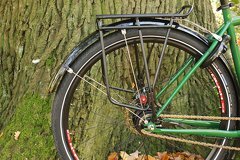 The only good things I can say about these mudguards is are not that expensive and that they come in many different sizes. The SKS Bluemels fitted on a bicycle with disc brakes. The SKS Bluemels are bigger than most mudguards, the stays from the rack had to be bent upward to fit. Here you can see the extension I had to make for the stays to fit around the disc brake. The mudguard also does not stay centered over the wheel.